grab both strut bars to reinforce your chassis and make it a srrong base for aftermarket coilovers and aftermarket sway bars. front strut tower first, then rear sway bar. you can of course do them at the same time. those two combined is plenty sufficient. Tanabe front and rear. I'd get them both at the same time. If you can afford it, get the Tanabe rear tie bar as well, it goes underneath the car, somewhat in front of the sway bar. Other option is the Neuspeed 4 point front strut bar, and a DC, Megan, or Tanabe rear and one of those 3 names for the tie bar, if you can afford it. It's a good idea to tighten the rear up some because our cars tend to understeer anyway. definitely do this mod. i but them on my base and saw a huge difference. not to thread ho but i have Megan Front Upper and Rear Upper Strut Tower Bars and Rear Lower Tie Bar all in BLUE for sale. RU and FU bars were installed for 4 days, RL tie bar is brand new. let me know. If you can find a DC Sports rear lower tie bar, definitely jump on it. Polished aluminum looks perdy when its shining under your car. by the way would the rear lower tie replace sway bars or would i get those to? No no no. Tie bars and strut tower bars only stiffen the body of the car. Sway bars prevent the car from "swaying" (leaning) in cornering. btw, check this pic. suspension technique sways and my DC tie bar. interesting color combo. green swar bar, red shocks, gun metal springs, and polished alum tie bar. Hmm. Good luck finding a DC bar. They don't make them anymore. Try and find one from a private seller as thats the only way you're gonna get one. But yea, piece of advice. If you're planning on getting the Suspension Techniques sway bars, they don't come with new end links, so make sure you get some whether they're OEM or some other aftermarket kind. When installing/using performance sway bars, you will destroy the bushings on your end links. So, unless you love obnoxious clunking noises in your front end, I recommend some new end links. You can get some OEM end links from ImportRP.com. They aren't listed on the site, but if you contact ImportRP using AIM, they should be able to point you in the right direction. hey would these be a good buy? What brand are they? I know Ground Control makes coilover sleeves, like those, that go over the shock. Basically like a lowering spring. I dont know much about those, someone else wanna help this guy? x2. if they're ground controls, and for a decent price..... get them. if they're anything else, like XTREMMEEEEE coilovers..... don't even bother. Don't keep the stock strut if you're lowering. Jesse, do you have the front ST bar too? Did you put them on at the same time as the tie bar or different? Which did you do first, and how much does the tie bar really help with the sway bars? Progress rear sway bar ftw. All strut bars seem the same to me, and from what I hear don't make huge differences unless it's under high stress. It depends. 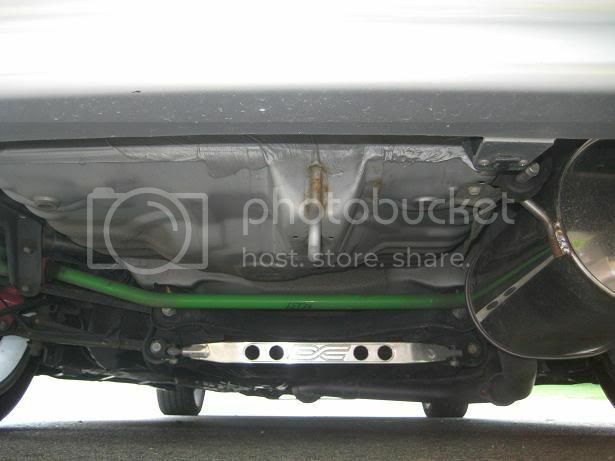 I found the biggest difference the strut brace made was on low speed tight corners, carpark buildings for instance. Not that you should be driving fast in a car parking building. The ST sway bar? Yea. I did the rear one first, then the next day, I did the front. And I put the tie bars on the night I finished the Drop Day Project. So I didn't have a chance to feel it without them. But with the whole setup, it feels really great. I'm still oversteering since my ATTS is out, but it feels good through the low speed stuff. I'd say look into Koni Yellows. As it's been mentioned several times, they dont make Koni Yellows for the SH. You have to use the ones for the Base, but if you do that, make sure you get the BASE springs (whatever manufacturer you wish). Base shocks + SH Springs = No workie. Or just solve the problem in the beginning and get KYB AGXs or whatever you wish. go with KYB AGX's paired up with Eibach or H&R springs. add some sway and strut bars and you'll be set. don't forget rubber, make sure you have a good set of tires, trust me!